Animations and dynamic effects have become an integral part of modern websites. They are no longer something extraordinary, they just standard tools for enriching user experience, making the project more harmonious and enjoyable. Today we are going to pay attention to tiny subtle effects that may at first seem to be insignificant. However, even despite their short-duration and almost invisible impact, they perform an important role. They glue design together, let projects breathe with life, and enhance structure. As a rule, transitions are linked to a scrollbar, which tracks user’s movement and switches them on at the right moment. 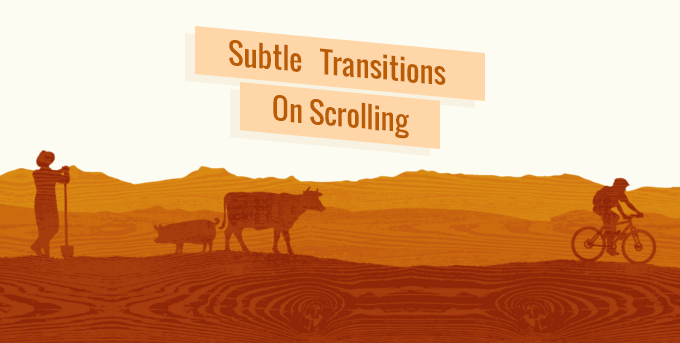 We are going to examine various uses of subtle transitions activated by scroll bars. The Garment Club looks stylish and elegant. Well-balanced layout with light coloring and perfect formatting set up a marvelous general feeling. Sleek transitions used for displaying blocks of the content and adding a slight sense of motion fit here like a glove. Much like the previous example, Alpha Design has a refined and delicate aesthetic that is based on a harmonious symbiosis of copy and visuals. An eye-pleasing effect is used to reveal data of each section. In some cases, it accompanies the emergence of the image in others. triggers other components. Rudys has a clean and slick theme. Being based on a primitive yet intuitive modular system, it easily handles all the images. Subtle effects that are switched on on scrolling add a flavor and heighten sophisticated appearance. To avoid boredom and dreariness, NNG utilizes some tiny twists that add motion to the project and energize some sections. Each block features a fancy effect. The team leverages fade in/out, slow emergence, smooth sliding and other solutions. Spark House Labs employs scrolling to activate some animations. The latter helps to portray supportive images and sketches in an enjoyable fashion as well as provides the project with a piquancy. Lear Corporation makes use of several transition effects that offer a smooth flow through the project. Each section is spruced up with splendid non-static appeal. Avalanche is an interactive and visually appealing online portfolio. Although the team opts for a more clean and sleek look, some twists spin the website creatively. There are carefully designed mascots and sketches, and of course, a handful of little animations that unobtrusively follow the users while they are moving down. RDesignd has a modern and sophisticated website. Almost each section utilizes animations or effects to enrich user experience and add a note of playfulness. Although the team goes for standard solutions such as animated progress bars to display skills, on the whole, the project produces a fascinating impression. Swallowing Tablets is a small interactive infographic that owes its beauty to cartoonish illustrations and supportive effects. There is an informative vertical timeline that reveals important data. Subtle motion lets it look more informal, natural and amusing. Snipcart has a trendy long-page website with a robust structure and a lot of content. The latter is broken into text and graphics to communicate the message more effectively. Each section features an accompanying illustration that is charged with movement. Axteria exudes an image of freshness, elegance, and refinement. The asymmetrical layout adds spice to the user experience. Not only does the project include subtle transitions that enhance the emergence of content, but it also has some other dynamic elements that achieve a greater impact. A beautiful and decorative atmosphere prevails on this project. Being a long page website, it has many features that add motion. Basic subtle transitions skillfully jazz up the theme. Vermont Smoke and Cure employs subtle transitions to add a tasty flavor and enrich main sections of the website. It has an artistic vibe thanks to marvelous illustrations that are bolstered by little yet eye-pleasing effects. The WNDRLND prefers a classic approach that is obtained through a black and white color scheme, sharp and elegant typography, the optimal balance between copy and visuals and a ton of white space. Although sleek transitions play here a secondary role, they finish off the theme and reinforce the harmony. Prevue has a graphical nature that develops incredible user experience. There are several tiny vibrant and line style drawings that enhance website aesthetics and enrich the theme. Graphical stuff does not go alone; it is bolstered by dynamic effects. Addiction is a visual storytelling website that raises important issues in a creative manner. The team utilizes scrolling to ignite various blocks with energy and dynamics. Illustrations paired with animations – a winning combination. Deux Huit Huit has a flawless and fresh appearance. The clean and robust structure goes perfectly well with some dynamic features. The latter is used to make the emergence of content blocks look pleasant and inviting as well as unobtrusively directs the attention to important elements. Andreoli leverages subtle transitions to accompany the drawings of graphics. Since the website has a clean and neat appearance, these tiny tricks enhance UX and give it a particular charm. Kilani successfully embraces the power of minimalism. The front page looks sophisticated, modern and exquisite. There are no decorative details, only copy, and images; however, the project evokes quite powerful feelings. Sleek transitions that spice up each section make a significant contribution. Holm Marcher and Co uses a gorgeous pastel coloring and modular foundation in a creative way. Dynamic features let the project sparkle and excel. Although there are no lavish animations, only small regular effects, but they manage to add a flavor and reinforce the businesslike atmosphere. Tiny subtle transitions can do wonders for a project. They can easily save it from looking boring and dull as well as improve the theme with some eye-pleasing and attention-grabbing details. Used wisely, they are able to breathe new life into any UI.